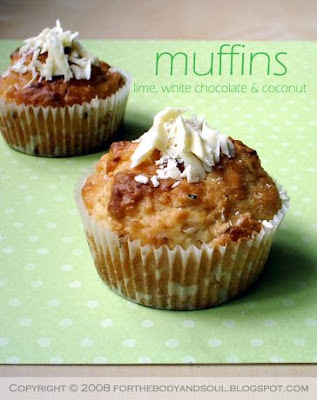 These muffins are really irresistible; they're fragrant and very refreshing with a subtle taste of coconut and intense sweetness of white chocolate cut by the tart flavor of lime. The coconut provides a nice contrasting structure to the melting white chocolate, while the lime flesh gives the muffins some extra moistness. All these together make a delightful combination of textures and flavors. The recipe for these has been adapted from Grab Your Fork food blog. The original version can be found here. Enjoy!!! Notes to the recipe: Malibu can be substituted with another coconut liquour. Grate the zest of the lime and set aside. Cut the outer pith from the lime and then carefully slide the knife under one membrane and gently remove a segment of lime flesh. Continue until all lime flesh has been extracted into a bowl for later use. Sift the flour, baking powder and salt into a large bowl. Stir in the sugar, coconut, and white chocolate. Make a well in the centre. In a separate large mixing bowl, mix together the egg, milk, vanilla and Malibu. Stir in lime flesh and rind. Pour the egg mixture and melted butter into the well. Mix quickly just until the ingredients are combined, taking no more than 15 seconds as over-mixing will prevent them rising. Spoon into the muffin pan filling ¾ full. Just great! I'll try them! Fabulous muffins... they didn't last 3 hours!